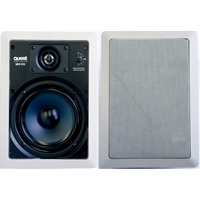 QW Series In-Wall Speakers deliver hi fidelity full bandwidth sound to all small to mid sized building spaces. High vocal intelligibility is the hall mark of the QW series with no compromise in music reproduction. Models available include 165 mm (6.5 inch) and 200 mm (8 inch) woofer two way flush mount speakers. Custom designed components and user aim-able titanium diaphragm tweeters ensure ample high frequency coverage, delivering well-balanced sound to any listening position. A sophisticated 18 dB slope crossover network designed to optimize the sonic and power handling capability of the speaker components. Installation is effected by rotating cams to secure the speaker designed for recess installation in false ceilings or vertical panels. Input is via metal press terminal speaker connectors in high temperature resistant mounting configuration for a quick installation. Casing material is flame retardant PE plastic with a removable aluminum front grill.